7 Days-6 Nights, 10 Dives and flights ex Brisbane $3,195 inc meals! 10 Boat Dives (6 shark and 4 reef dives) plus unlimited house reef dives. Use of tanks, weights and dive guide services. Note Prices are subject to change without notice. to secure a booking, a completed booking form and $900 deposit is required. A short boat trip from the mainland, Beqa Island Resort is the idealistic Tropical beach resort. Nestled amongst palm trees with white sand beaches and Bures in beautiful gardens, and it is what tropical holidays are made of. Twin Share, air conditioned Bures with either garden or beachfront views. A great location for non-divers to join you too. Included in the package is 10 Boat dives and unlimited shore dives on the house reef are available (not on day of arrival or departure). The trip also has all meals included, when you add it up, this trip has great value for money. 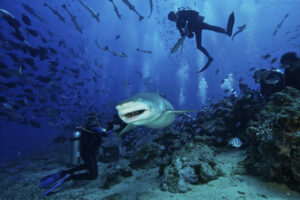 Tiger Sharks are seen on most dives! Beqa Lagoon Resort have a unique Shark feed with Tiger Sharks seen on most dives, in fact it’s usually not a matter of seeing a Tiger Shark, it is a matter of how many Tiger Sharks you see on a Single Dive! 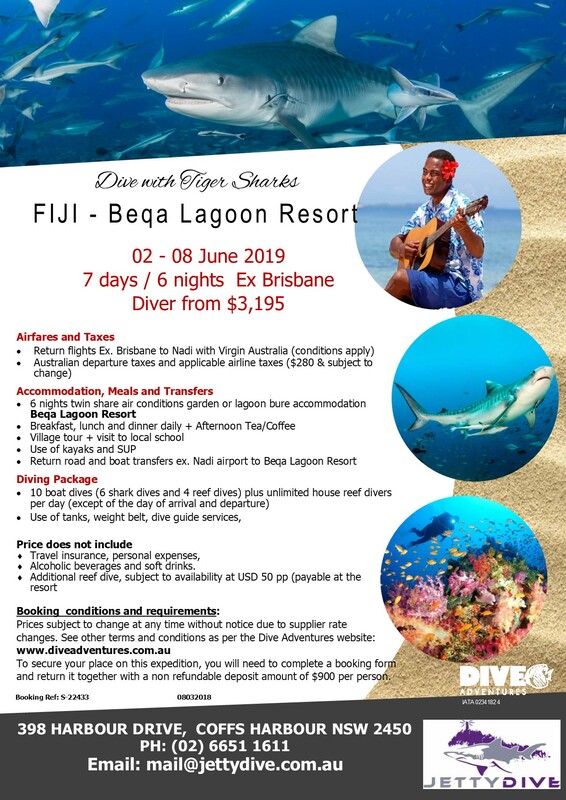 The trip includes 6 shark dives, which is more than enough to get your fix on these action packed dives, and along with that is 4 Coral Reef dives in areas where they have amazing Soft and Hard Corals and their associated fish life from Clownfish to Groupers.